Take a look at the two school districts I highlighted. On the left, third-grade students are performing at a kindergarten level. On the right, third-graders are performing at a sixth grade level. That’s an enormous difference, but not necessarily one that you can blame on schools. But that’s not all. The vertical axis shows progress from third through eighth grade, which is more plausibly related to school performance. In the school district on the left, kids gain only about 0.8 years of achievement for each year of schooling. In other words, they fall even further behind. On the right, kids gain 1.2 years of achievement per year of school. By the time they’re both in eighth grade, one group of kids is performing at a fourth grade level while the other is performing like high school seniors. Alternatively, take a look at the schools that I’ve circled. Third-graders are performing at third-grade level, so that’s fine. But then they fall off a cliff. Over the next five years they gain only about 0.4 years of achievement per year of school. By eighth grade they’re performing at the level of fifth graders. They’ve made barely any progress at all. Obviously not all of this is the fault of the school districts. But surely some of it is, and it’s a national disgrace that the differences are so stark. 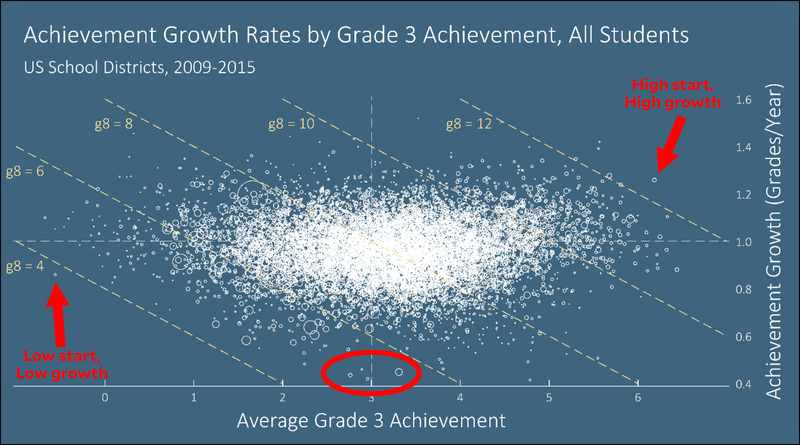 However, what’s really striking about this chart is how random it is: third-grade performance is almost completely unconnected to growth between third and eighth grades. And it’s only weakly correlated with the income level of a school district. The South does really badly. Florida is an almost insane basket case. Tennessee is a green oasis in the middle of a desert of purple. Someone should figure out what they’re doing right. There are plenty of big-city school districts that also perform strongly. Chicago is bright green. Seattle does well. New Orleans does well. Conversely, Baltimore, Los Angeles, and Atlanta all start off poorly and continue to do poorly between third and eighth grades. What may be surprising, however, is…the fact that these growth opportunities are at best weakly correlated with early opportunities and with socioeconomic status. Growth rates better isolate the contribution to learning due to experiences during the schooling years. Grade 3 average scores are likely much more strongly influenced by early childhood experiences than the growth rates….Some caution is warranted in interpreting the average growth rates as pure measures of school effectiveness. Nonetheless, relative to average test scores (at grade 3 or any grade), the growth rates are closer to a measure of school effectiveness. If we take the growth rates, then, as rough measures of school effectiveness, then neither socioeconomic conditions nor average test scores are very informative about school district effectiveness. Many districts with high average test scores have low growth rates, and vice versa. And many low-income districts have above average growth rates. This finding calls into question the use of average test scores as an accountability tool or a way of evaluating schools. The findings also suggest that we could learn a great deal about reducing educational inequality from the low-SES communities with high growth rates. They provide, at a minimum, an existence proof of the possibility that even schools in high-poverty communities can be effective. Now the challenge is to learn what conditions make that possible and how we can foster the same conditions everywhere.